Panzer VOR! 3 German Armor at War Book 1939-45 Discounts Apply ! CON7060 - Panzer VOR! 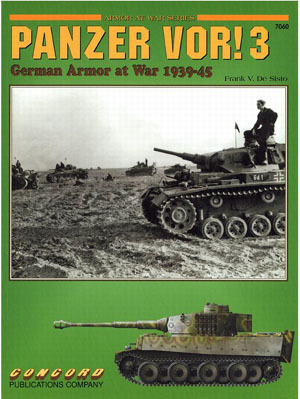 3 - German Armor at War Book 1939-45. The trilogy continues! This is Frank De Sisto's third volume in his series on German armored vehicles of WWII. The format is identical to the two volumes that have previously been published; descriptive text, quality photos, explanatory captions, and a series of excellent color plates by Laurent Lecocq. In this third volume, the text commences with a brief description of the principal families of tanks fielded by Germany (for example, the Panzer I, II, Tiger). The black and white wartime photos are wide-ranging in their coverage. Many of the photos are new and will be of great interest to modelers, or those simply interested in German military vehicles. The photographs range from early war through to late war. They cover the smaller Panzer I through to the devasating Tiger tank versions. They cover armored cars through to heavy tanks. And they also cover vehicles operating from France through to those on the Russian steppes in the East. The author went through great lengths to write captions that are extremely accurate, and that offer insights into vehicle details and how armored vehicles were typically employed. A lot of painstaking research and many years of familiarity with reference sources went into this book. Panzer Vor! 3 is an excellent pictorial examination of armored vehicles in action, and is the perfect complement to the two earlier volumes. Readers will be pleased to know that in this volume they will find an accurate and informative text, along with a large number of inspiring photos. This fascinating book would be an excellent addition to any military enthusiast's library, but especially for those with an innate curiosity about German vehicles of war! Features: 72 pages, 172 b/w photos and 16 color plates.